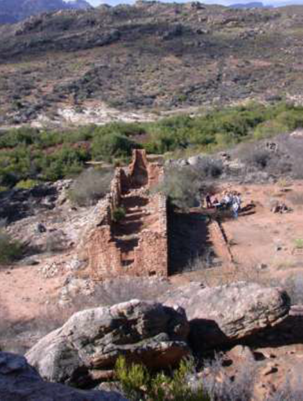 On a small farm, Warmhoek, near to Clanwilliam, 250 km northwest of Cape Town, agrarian structures, the standing ruins of a farmhouse, and the foundations of a small building, were present on the werf (farmyard). Archaeological fieldwork and research signalled an ambiguous relationship between the two buildings, and their relationship to and the chronology of the agrarian structures was problematic. Deeds Office property transfers recorded several owners between 1896 and 1933. Clanwilliam Quitrent records identified a Crown leaseholder from 1873 for twenty-one years, but in 1889 the Surveyor-General approved a sub-lease to two ‘Coloured’ men. This history offered a chronology that could be compared to material culture, and genealogical records and personal testimonies gave insight into the agencies of owners and occupiers. Interestingly, surveyors’ reports and diagrams do not refer to any built structures on the site – they are quite simply “absent”. Furthermore, biographical data of the leaseholder and owners of the property strongly indicates that none of them ever lived there. Moreover, the names of people known by oral testimonies to have lived in the house do not appear in any record of the property. In fact, the only “occupants” of the property to be named in an official record are those of the sub-tenants, who never acquired ownership. These facts must surely provide a cautionary note to researchers who might be tempted to assume identities of agents such as designers, builders, restorers and occupants of vernacular structures. With reference to area politics and contemporary laws governing the disposal of land in the Cape Colony I found that the 1889 sub-lease was the pivotal event in the history of the property. It led to an application by two Coloured men to purchase land which was contested by the Afrikaner owners of contiguous farms, one of whom subsequently acquired a small portion of the property on which he constructed the “Warmhoek” farmhouse. Yvonne is currently Chairperson of the W. Cape branch of the S A Archaeological Society (SAAAS). She joined the Society in 1989 in Johannesburg after a visit to the replica rock art caves at Lascaux 2 in France was followed by a lecture in Johannesburg by David-Lewis Williams on that topic. After twelve years of attending numerous lectures and outings with the Trans-Vaal and W. Cape branches of SAAS, she decided to formalize her archaeological education and registered in 2001at UCT for an archaeology major, for which attendance at Field School was a requirement. The farm house on a small farm on the Jan Dissels River, Clanwilliam, had been identified in 1999 by Antonia Malan and Tony Manhire as a potential excavation site for UCT students and this was her introduction to “Warmhoek”. In 2006, after 6 seasons of excavation by students supervised by UCT staff, Simon Hall and John Parkington invited her to curate the artefacts from the site and to conduct further research. Research required analysis and interpretation which was supported by data from student projects submitted each year and included field notes of UCT supervisors and additional archival research: official documents, genealogies, wills and libraries. Yvonne’s M.Phil dissertation was awarded in 2011.